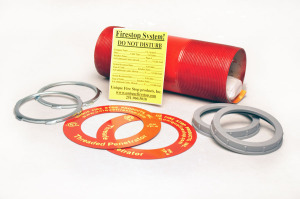 When you need to install a cable outlet inside a firewall or smoke wall, our Membrane Firestop Cable Sleeve is uniquely qualified for the job. Our “angled design” allows a BUNDLE of cables to be dropped inside a Firewall Membrane. This is the ONLY mechanical multi-cable system available that performs like this while maintaining proper bend radius specs. This UNIQUE product is an angled firestop cable sleeve that cuts its own hole and installs in 2 minutes, allowing for a UL Classified path to fish cables inside a firewall. The System creates its own hole with the sharp point on the back side of the sleeve. A bead of caulk (not included) is applied to the back of the system and the sleeve is secured to the wall with expanding anchors. UNIQUE Intumescent Putty for sealing this firestopping system is included. We make this system in the USA in our own factory. UL classified for fire-rated gypsum board/stud walls (one side) for up to 2 hours. Available in 1″ and 2″ diameters. Product includes everything you need, including intumescent putty. 1 – Membrane Firestop Cable Sleeve, a 6″ square metal plate with a 1″ or 2″ inch sleeve (6″ long) welded at a 45 degree angle to the plate. Download the original AHJ Request Form for pre-approval of your firestopping system. Use it for submission to the Inspector so he/she may pre-approve your proposed System. Use our convenient new form to email your proposed firestopping system specs to your AHJ- (Authority Having Jurisdiction)- for preapproval. See the new form on the ‘Inspector Form’ tab. See also Unique Firestop Caulk – You will apply a small bead of firestop caulk to the back of the plate and around the sleeve to seal the Membrane Firestop to the wall. 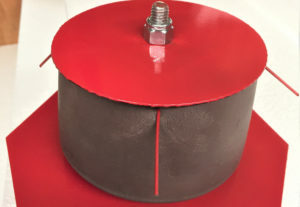 All UNIQUE firestop cable sleeve systems include enough UNIQUE Intumescent Putty for a minimum 25% and maximum of 48% cable load. Order an additional Intumescent Putty Fill Kit here if needed. Take our Free Training and Certification Test to become one of our Certified Installers and receive special discounted pricing on our products. System contents: Membrane Firestop Cable Sleeve, bushing, anchors, label and UNIQUE Intumescent Putty. Prior to installation, remove the anchors, putty, label, and plastic bushing. Determine the cable wall outlet’s location and place the pointed leading edge of the sleeve plate directly above your cable outlet (above the grid). 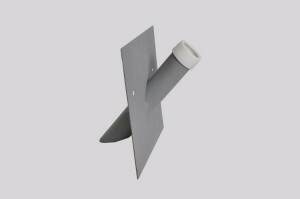 Carefully drive the Membrane Firestop Cable Sleeve into the wall. Make sure the plate fits flush against the wall. Now, remove the plate and go on to the next step. Be sure to clean out the back of the wall where the hole was made by the sleeve. Apply a small bead of firestop caulk to the back of the plate and around the sleeve to seal the Membrane Firestop to the wall. Re-insert the system into the hole you made. Now, carefully drive the expanding anchors through the face of the system and in the drywall. There are small slots in the holes for the anchor to grab, allowing you to fully expand the anchor while securing the plate flush to the wall. Note: The Membrane Firestop is now permanently installed. Don’t forget to carefully push the bushing back on. Drop your cables through the sleeve and down to the wall outlet. Cable load is 40%. Apply an inch thickness of the supplied intumescent putty in the top of the sleeve. Be sure to fill out the Documentation Warning Label. It is recommended that you take a picture of your installed System for future reference. Use this convenient form to send your proposed firestopping system specs to your AHJ- (Authority Having Jurisdiction)- for preapproval. Your System is approved when the Inspector says it is! 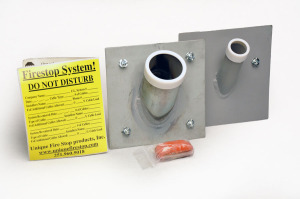 Note that you will use one AHJ form for each UNIQUE firestop product you specify. Request for AHJ Consideration. 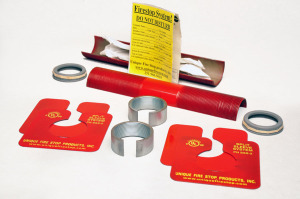 Unique Fire Stop Products Submittal Form. -This form is designed to save you time in getting AHJ preapproval for your Unique Fire Stop Products cables firestopping project. You will fill out one form for each product you recommend. Fill it out completely using the product page on the website as a guide. Note that most fields are required, as shown by the asterisks (*). -When you have completed the form, click "Email to Inspector" at the bottom of the form. The "Note to the Inspector" (below) will appear at the top of the email along with all the information you select on this form. You will also receive a copy at your email address. -You also have the option to click on "Save and Continue Later". You will then receive an email with a link to the saved form. -Call our friendly Customer Service Support if you have questions: 251-960-5018. -Please review the following firestop method we propose for firestopping our telecommunication cables. When your review is finished, please return this form to the person making the request- (Your name and email will appear here) -along with a note indicating your approval or rejection and reason for rejection. 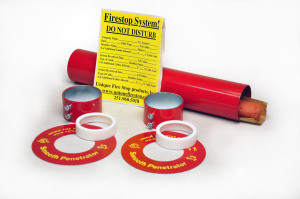 -All firestop systems will be installed to the manufacturer's specifications. -Method of ID and documentation on all systems is by digital photo and alpha-numeric identification. -All systems to be digitally photographed front and back and available to you upon request. -Note that you may have to adjust your email settings to view images in this email. Use this section to include any other installation details required by the AHJ along with links to any additional required submittal documentation.